Are you a happy owner of a ferret? You are lucky to spend much of your free time with this cute little creature, but ferrets do need entertainment similar to people. Take care of your pet and get it the best ferret toys to guarantee it exciting and at the same time secure entertainment. It goes without saying that not every toy can be given to a ferret. Like infants and toddlers, they may break a little piece off the toy and swallow it or get injured by sharp details. That is the reason to give ferrets only those toys that were created especially for small animals. Manufacturers use special materials that are safe for animals, develop toys considering the behavioral peculiarities and their tastes. As a result, your ferret will get the most suitable ferret toys and accessories to make its life vivacious and fascinating. Do you want your ferret to have an extreme adventure? A thru-way from Marshall brand will take it to the quite long tunnel with multiple bends and the only way out. One of the natural instincts a ferret has is to explore new areas and this tunnel will be a great thing for that. 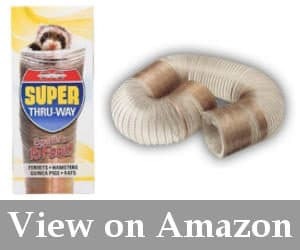 Being one of the most exciting ferret toys, this thru-way is available in two sizes – 15 and 20 feet. It is flexible to create different bends each time and its lungs can be adjusted according to your preferences. In addition, you can collapse it and it will not take much storage place. One more great benefit of this ferret toy is a clear design. The owner can clearly see at what stage of the tunnel a ferret is, how it moves and help it if there are any difficulties. The ferret toy is absolutely safe and has no exposed wires, so your little friend will enjoy it for a long period of time. The maze can be both laid on the floor or hung on the furniture to let your ferret climb and make the adventure much more fascinating. Reaches the critical length only when stretched. Forget about a pricey ferret cage with tunnels as with ferret toys as this maze you can make different tunnels every day. Quality and stretching maze can be adjusted by length and hung anywhere to encourage the ferret to climb and entertain itself. Whether you get one or several ferrets, it is important to make their leisure time interesting. Marshall brand offers a unique ball put ferret toy to keep these small creatures busy. The Pop-N-Play Ball Pit is a flexible framed box made of fabric. There are rounded corners and two holes for a ferret to jump inside it. This box is filled with 35 small balls included in a pit. They are bright and colorful allowing a ferret to have a digging fun. The box is foldable and gets flat to take little space for storage. It is one of the great ferret toys designed with these creatures in mind. Pets enjoy jumping in and out of the holes. It can be combined with a tunnel and has a handy Velcro tab for attaching it to different surfaces. The fabric of the box is durable and strong, can be easily cleaned if you wipe it. Small balls made of thin plastic. 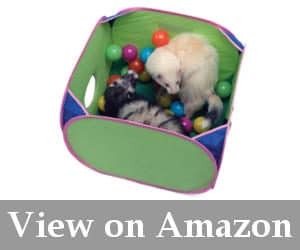 There are hardly any other ferret play toys that will keep ferrets entertained so long. These tiny animals will enjoy jumping into the holes, playing with balls and chase each other around it. It will be one of the most favorite ferret toys. Not all ferrets love sitting in the cage or kennel so it is important to attract them with a funny toy and they will enjoy spending time in the cage thanks to that. A hammock hanging inside the cage is a great toy to exercise and have fun. This hammock has a beautiful polka dot design: it has a combination of white and black colors. The fabric made from 100% polyester is soft and comfortable with the faux wool interior. You should clean it in the washing machine on any cold setting. The hammock is easy to install thanks to the snap clips that are easily fastened to the cage. These clips hold the hammock safely and securely. The cage hammock is 21 inches long and 12.5 inches wide. It fits the biggest part of cages and can be ordered in two more animal designs. Is not always used by pets. The hammock is undoubtedly one of the best toys for ferrets cage. It is not only funny and interesting to use it but it turns out to be an adornment of the cage. 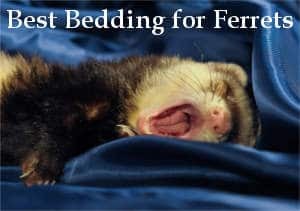 Let your ferret have a cozy bed for sleeping and a nice swing in one thing. Kaytee brand created many interesting accessories including ferret toys. One of them is a tent. It has a form of a pyramid where every side can be zipped. You can unzip two sides and open one of the tent walls or all the sides to get a hammock. There is a fleece interior for better comfort and a round hole on one of the sides that serves as a front door. The tent can be placed on the floor or attached to any wire using 4 carbines on its top. As a result, it can be hung and serve as a swing for a ferret. In this tent, the ferret will have a secure and silent sleep any time of the day. There is enough space for every small creature as it is 11 inches wide and long and 14 inches high. The exterior of the tent is available in different colors, while the fleece interior is always black to calm the pet down. The animal will like hiding in its small home as well as enjoy to swirl or swing in it. Ferrets can unzip the tent themselves. 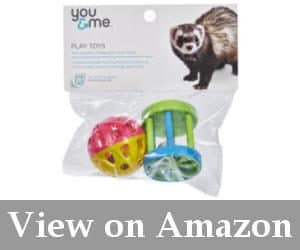 If you are looking for good toys for ferrets that are durable and functional, it is worth paying attention to this example. This lovely tent can be used as a sleeper, hammock, swing, home etc. It is comfortable and easy to use, so deserves to be called one of the best ferret toys. Ferrets adore mazes, tunnels, and tubes. They are predators and look for places to hide, so a soft and comfortable toy tunnel will be a nice choice. Why not buy a tunnel made in the form of a tunnel? There are entrances on each paw and head, so a ferret will move through them or hide inside the toy. The turtle is big enough to hold several pets and has a bright green color to attract the animals. The ferret owners can use this interactive turtle to play with their pets closing one or another exit. As the turtle is made from durable fabric it is washed by hand and requires flat dry. Ferrets might take out the foam if left unattended. Only a quality toy will be safe for active ferrets and this turtle tunnel is undoubtedly so. 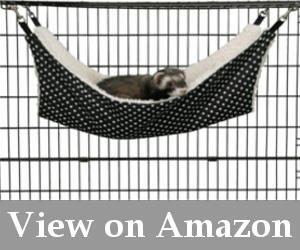 Put it in the cage to entertain the pets or use it as one of the ferret toys outside it. They will love hiding in it or even use it as a sleeper. It is a set consisting of two colorful toys: a red and yellow ball and green and blue wagon. They are made from durable plastic and have little bells inside. These ferret toys help to stimulate hunting and hoarding instincts as well as encourage exercising through gameplay. Unlike ferret teething toys these small balls should be not bitten by the pets, but they will provide an abundance of fun if to spread them around the cage. An animal will dig into them, push and kick them or the balls can be used as an addition to the ball pit toy from Marshall brand. This toy is meant for ferrets that got tired of sitting in the cage. It is a plush strawberry toy attached to the elastic strip. The strip has a carbine on one of the edges to attach it to any cage. Any time a ferret will play with the toy it will bounce wildly back and keep the animal interested and playful. It is important for every ferret owner to encourage the ferret to let its hair down and a good toy can be a helpful thing to do that. However, the choice of ferret toys is a very responsible task as it should not only be appealing to the animal but also be entertaining, safe and durable. It goes without saying that ferret toys must be of high quality. These little creatures are very inquisitive and active, so they can easily break non-quality toys and even injure because of them. That is why it is necessary to buy ferret toys created especially for small animals and it is better to prefer examples of recognized brands. Ferret toys are made of different materials, but most often it is fabric or plastic if these are not ferret chew toys, of course. You should always check the quality of the material before you give the toy to a ferret. If it is reliable and withstands the human’s pressure, it is more likely that it will stay in good condition in the ferret’s cage too. When the material is close to breaking u dyer pressure, avoid giving such a toy the ferret to prevent possible negative consequences. A toy is designed for playing games, but there are examples that are used as tunnels, mazes, hammocks, swings, sleepers etc. Choose the toy with regard to the behavior of a ferret and its habits and preferences. Undoubtedly, safety is one of the most important characteristics in toy choice. Avoid toys with small plastic details, sharp edges, toxic materials. Secure your new family member from possible troubles and choose only safe and reliable examples of ferret toys. It is always not easy to choose a toy for your pet ferret. These animals differ in character, temperament, tastes so the only right advice, in this case, is to rely on the pet habits and owner preferences. It is you who will play with your ferret so you should like they toy too. Top 5 toys offered above will make the life of your pet more exciting and funny as they are manufactured by recognized companies that guarantee premium quality, utmost safety and correspondence with the pet instincts of every toy. I discovered your blog site on google and check a few of your early posts. The ferret toys you chose really look great. Continue to keep up the very good operate. Seeking forward to reading more from you later on!? Thankѕ very interеsting blog! Some of your suggestions ferret toys, I’ll definitely take note of yourself. I had no idea that ferrets shouldn’t be given the same toys as dogs and cats. I’ve been giving my ferret cat toys for as long as I can remember. No wonder why he never has enjoyed them… anyways, all of these products you shared here are wonderful and creative. Who knew someone made a ball pit for ferrets! Just wanted to stop by the comment section and thank you for putting together this incredible resource. All of the ferret toys you listed perfectly fit these animals and I can’t wait to purchase the hammock and see how my ferret reacts to it! According to the numerous owners of ferrets, most of them like to be in a hammock. I really like the thru-way by Marshall. The thought about giving my ferret it’s own little cave to hang out in and explore is a wonderful idea. Hopefully, he’ll love this creative toy! Couldn’t agree more, no one should be giving their ferret normal toys. 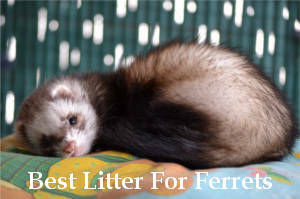 Instead, make sure that the toy can easily be picked up by your ferret and will not be something that it can destroy. 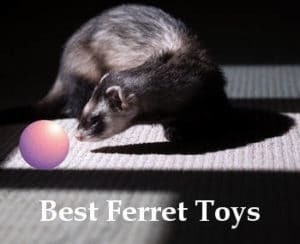 The toys above are excellent products that your ferret will be sure to love.